Family conferences are used very frequently throughout the “Partnering for Safety” casework process. These family conferences are used as a mechanism for involving family members and their networks at every stage of the assessment and planning process, including the development of comprehensive family-centred safety plans. This approach arises out of a belief that best outcomes for children are more likely when the immediate and extended family are at the centre of assessment and planning decisions about their children’s safety, care and wellbeing. The extended family can also include people who play a significant role in the child’s life, such as friends or godparents. The PFS conferencing approach integrates practice and wisdom from the Family Group Conferencing model from New Zealand, as well as the Family Unity Model, Family Group Decision Making Model and Family Team Meeting Model from the United States. Within the PFS approach, conferencing is integrated with and not separate from, ongoing case planning. Family conferences are used early in the life of a case and continue to be used throughout the case planning process, to involve the family and their network whenever a critical decision about a child is required. Family conferences are lead and guided by a facilitator. The facilitator’s job is to make sure that the conference has a clear purpose, that the people who need to attend are invited to the conference, that everyone is prepared for the conference, and that the conference process flows well so that everyone is able to work together as effectively as possible. The role of the facilitator is described in more detail below. If you are at the initial assessment stage, you want to involve the parents and the children (if they are old enough) in the initial assessment and in the development of an immediate safety plan if that is required. These conferences are usually organised quickly (sometimes within hours of a family coming to the attention of child protection services) but it is still sometimes possible to involve extended family members, friends or other professionals in these initial assessment and planning processes. If the children are taken into care following this initial assessment, a family safety conference can be used to involve the family and their network in initial decision-making about placement and about contact. Whether the children remain in the parents’ care or are placed in someone else’s care, we want to involve the family and their network in a more comprehensive assessment and in thinking through the changes that need to be in place to provide long term safety for the children (long term safety planning). Whatever stage of the case planning process we are up to, the intention within PFS is to involve families and their networks in every stage of decision-making and a family conference is used at each stage to facilitate the family’s involvement. Who is invited to the Family Conference? - Other significant people in the children’s and family’s lives, which may include friends, neighbours, support people, etc. - Other professionals or service providers who are involved in working with the family or who may work with the family in the future. The decision about who is invited to attend the family conference is made collaboratively between the family (parents and children) and child protection services. The general principle is that the parents and children can invite whoever they wish to attend the conference, as long as that person doesn’t need to be excluded for safety reasons. Child protection services may want to include family members or other professionals who the parents/children may not want to attend, or vice versa, and this needs to be explored and negotiated by the caseworker or the facilitator with the family. It is the responsibility of the facilitator to ensure that there are arrangements and process rules in place so that everyone’s voice is heard and everyone is safe during and after the family conference. Family members or significant others who are not able to physically attend because of distance, or other circumstances such as safety concerns, can still be included in the conference through mechanisms such as skype, telephone, by letter or drawing, or via a separate meeting to elicit their views. These views could be documented in the PFS framework or using tools such as the Three Houses, Safety House or Family Roadmap. The question is not whether children and young people will participate in family conferences, but how will they participate. It is important to find ways for children and young people to participate that maximise their involvement and that uphold their physical and emotional health. Children and young people might attend all or part of the conference (as long as they are physically and emotionally safe in doing so) and this is a decision that needs to be made jointly by the parents, the child/young person and by child protection services. In conferencing models around the world, there are a range of opinions about the age at which a child might attend a family conference. In the Partnering for Safety approach, our view is that if the child is old enough to understand the purpose of the family conference and wants to attend, then they are old enough to attend (as long as it is safe for them to do so). It is important that the purpose and format of the family conference is explained in detail to the child/young person so that they can make a meaningful decision about how they would like to participate. Participation can occur on a continuum from the child/young person attending all of the conference and sharing their views, right through to not attending and having someone else share their views. Careful preparation and planning is essential to ensure that the child is able to participate as fully as possible. Tools such as the Safety House or Three Houses can be used with a child or young person to bring their voice into the family conference as can other creative mechanisms such as videos, letters, artwork, etc. The definition of facilitate is "to make easy" or "ease a process". A facilitator helps a team or group work together effectively by guiding and leading the group process. “Great consultants advise clients on how to solve problems. Within family safety conferences, the facilitator is the person who guides the meeting and concentrates on helping everyone who has come to the conference to work together as effectively as possible. · Creating a group process that flows well and that enables everyone in the group to participate. · The group is able to reach a successful decision, solution or conclusion. · The conference helps to build the relationships of the people in the group. Why do we need a facilitator? The issues that are being discussed within family conferences are highly complex and often distressing and talking about these subjects can trigger strong emotions within the group. There may also be widely divergent views within the group: Individuals may hold very different views about what is going on within the family and there may be a lack of agreement about the problem or whether or not a problem actually exists. These complex factors make it very difficult for people to talk together and a facilitator can be enormously helpful in creating an environment where the members of the group can listen to each other, bring some clarity to defining the problem, and work together to create solutions. The other reason that a facilitator is very important is that the family conferences are part of a broader change process. With any change process, it is important that there is commitment to the change and not just compliance. We are asking family members to make significant changes in their lives with the goal of future safety for the children and there is a greater likelihood of families putting the change into action if they have been part of creating the solution (for example, the safety plan). Facilitation focuses on creating an environment of participation and collaboration, which increases the likelihood of family members and safety network members being committed to the outcomes. Does the facilitator need to be neutral? In many business and organizational contexts, facilitators are usually a neutral or independent person who has no attachment to a particular outcome. This neutrality or objective position is important, as the facilitator is then able to step back from the detailed content and from their own personal views, and focus purely on the group process and on helping the group work together well to achieve their objectives. In child protection contexts, the lack of resources can make it difficult to always provide an independent facilitator. Some child protection jurisdictions have a team of facilitators whose primary role is to facilitate family conferences. Other jurisdictions have a system where team leaders or supervisors or senior practitioners can facilitate family conferences for other teams. But in many child protection systems, because of resourcing or organizational issues, it is up to caseworkers or supervisors to facilitate the family conferences. In my experience, it is possible for caseworkers or supervisors with good facilitation skills to effectively facilitate family conferences for most cases (for really challenging or contentious cases, you might want to try to persuade another supervisor to facilitate). Child protection agencies have enormous power to intervene in the lives of families and in the parent-child relationship. While this statutory power needs to be exercised if a parent is unable or fails to protect their child from preventable and significant harm, I believe that child protection agencies have a responsibility to ensure that this power is exercised in ways that are respectful and preserve the dignity of family members. Family conferences are designed to foster inclusiveness and collaborative decision-making, so that the strength, capacity and empowerment of parents and families is enhanced rather than undermined by the involvement of child protection agencies. The expression “Nothing about us, without us” captures this commitment to ensuring that any planning about the family is done with the family. 2. Facilitating a family conference involves facilitating a change process. Family conferences are opportunities for family members, safety and support network members and professionals to meet together to identify the dangers for the children and to work out realistic and meaningful solutions. This is a change process, which may require that family members make significant changes in the way they are living their lives. Facilitation is the key that helps people make the shifts that are required in a change process: understanding the need for change, visioning a different future and acknowledging that real change requires changes in their own thoughts, attitudes and behaviours. In situations where family conferences are held, there are usually a range of factors that can make it difficult for the group to meet and talk together about the problems and work together to create solutions. The problems or perceived problems within the family are usually complex and there may be very different views about the problems held by professionals and family members, or by different professionals or different family members. There are often strong emotions associated with the harm or perceived harm to the children and the removal of the children from the family’s care or the fear that this may happen. And there may be other complicating factors that make it difficult for people to focus on the issues, such as substance use, mental illness, trauma or extreme stress. In situations where some or all of these factors are operating, it’s amazing that any type of collaboration is possible at all!!! Effective facilitation starts from a position of equal respect for all participants, which means that family members are viewed as being resourceful and being able to significantly contribute to the solutions. The facilitation of family conferences is based on a belief that best outcomes for children are more likely when families and their networks are able to meaningfully participate in decision-making about their children’s safety, care and wellbeing. Family conferences can be held at each stage of the casework process, whenever critical decisions need to be made. The role of the facilitator is to ensure that the structure and process of the family conference allows the family (and safety network) to participate to the greatest possible extent. As discussed in principle 4, it is common for participants in family conferences to feel and express strong emotions, such as grief, anger, despair or frustration. While this can be difficult to manage, I think that expressing strongly felt emotion is a legitimate and necessary part of people being fully present to the situation and being open to the process of change. What is important is that the expression of emotion doesn’t highjack the conference or get in the way of people being able to work collaboratively. So effective facilitation of family conferences involves allowing for and acknowledging the importance of authentic conversations, while ensuring that this happens in ways that are respectful and that enable the group to remain focused on working toward the desired outcome. Facilitation of family conferences involves simultaneously being able to offer high support and high challenge for the participants. If you are only offering support, participants may walk away feeling well supported and listened to, but without having been challenged to reflect on their assumptions or focus on the need for change. If you are only offering challenge, then participants may feel as if their views and positions are not understood and may get stuck in defensiveness and not be willing to shift. To create a space where participants can speak honestly about their own positions and remain open to hearing the views of others, facilitators need to offer a blend of high support and high challenge. 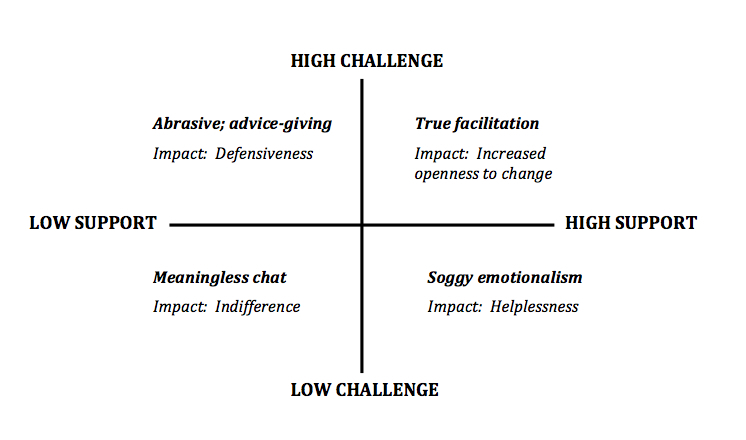 Jenny Rogers describes this in her “Support and Challenge Matrix” below. Most facilitation models or programmes recommend the use of an independent facilitator to establish neutrality in the facilitation role. However, in our busy and often under-resourced child protection agencies, the use of an independent facilitator is not always possible. Some child protection jurisdictions have organised their resources so that they have a team of facilitators whose primary role is to facilitate family conferences. Other jurisdictions have a system where team leaders or supervisors or senior practitioners can facilitate family conferences for other teams. But whatever the system that is operating in your jurisdiction, sometimes the caseworker or supervisor working with the family are the ones who need to facilitate the family conference. In addition to this resourcing issue, the “Partnering for Safety” approach is by its nature a conferencing approach, which means that caseworkers are frequently holding meetings with small or large groups of family members, safety network members and other professionals in the course of their day-to-day work. While the use of good facilitation skills makes an enormous difference to the outcomes of these meetings, having independent facilitators for all of these meetings is just not possible, so it is important that caseworkers and supervisors develop the capacity to be able to step into the facilitator’s role for cases that they are working with. In relation to the final point above, there are times when family conferences are called for the purpose of sharing critical information, but if the conference has been called for any other purpose, then it’s important that any contentious information is shared beforehand. This increases the likelihood that during the family conference, participants can focus on creating solutions and finding collaborative ways forward, rather than getting stuck in arguing about the past or reacting to new and challenging information. As mentioned above, it is the role of the facilitator to make sure that this preparation of participants has happened before the family conference. If the facilitator is someone other than the caseworker, then they might not do the actual preparation themselves (although this might be the case), but they will need to follow up with the caseworker or supervisor to make sure that someone has done this important preparation. 10. Involve the children in Family Conferences. The question is not whether children and young people will participate in family conferences, but how will they participate. Participation can occur on a continuum from the child/young person attending all of the conference and sharing their views, right through to not attending and having someone else share their views. In family conferencing models around the world, there is a range of opinions about the age at which a child might attend a family conference. In the Partnering for Safety approach, our view is that if the child is old enough to understand the purpose of the family conference and wants to attend, then they are old enough to attend. Children and young people might attend all or part of the conference (as long as they are physically and emotionally safe in doing so) and this is a decision that needs to be made jointly between the parents, the child/young person and the child protection agency. Family conferences are not one-off events and they are not separate from the case planning process. They are purposeful meetings that are held at critical planning and decision-making points within the casework process to involve family members and their networks in assessing and planning for their children’s safety and wellbeing. The casework that happens before, during and after family safety conferences has a significant impact on whether or not the family conference has a successful outcome. http://www.leadstrat.com/resources/free-articles/237 Rogers, J (2010). Facilitating Groups. Open University Press, McGraw Hill.